Crafted with genuine leather that will gradually achieve a lovely vintage patina. Thanks to its simple and attractive slip-through fastening system, this handsome accessory is adjustable to fit any size wrist. Comes in a neat little bag making it perfect for gift-giving. See how this bracelet fits you. 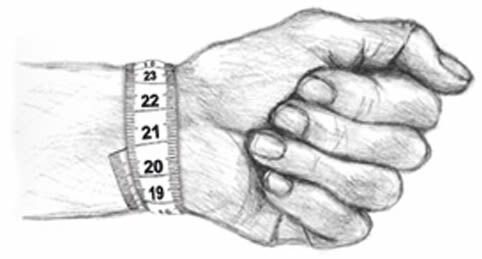 The average man's wrist is 18 cm. Use a normal tape measurer or a strip of paper just below the wrist bone, where you would normally wear a bracelet. Excellent anniversary gift for my other half. Very reasonably priced compared to those similar on the market. The skin is quality and the bracelet always stands different (plus in my eyes). I took it down and I'm happy - I would not pay a full price. Initially, it's hard to put on - which is related to the stiffness of the skin. After a time, this "problem" disappears. It's nice, especially if you have any idea about knots. Perfect, what's going on here. Color and workmanship super, very nice regulation, like a small detail and looks elegant. Match any style, and you can always choose other bracelets and it will blend well. very chic bracelet. Was a bit worried when ordering that the shutter could not hold, but completely unfounded. I would buy again! Very good material. Functional closure and great final appearance. A nice bracelet for a really nice price. I would use it for a gift and was very pleased with the quality. Nice effect on my wrist. Especially for men.Erg happy! Satisfied. Nice article for little money! To do! Completely consistent with the description. Nice bracelet for a good price! Easy to adjust the length, which means it should fit different wrists! Good quality. Just be careful with the clasp, it a little flu the material of the bracelet. It looks completely like in the picture. Quickly get patina. Nothing bad to say about the bracelet. Something hard to fix myself, by the way, just what I expected. It's good that you can decide the length yourself. The product presented perfectly meets the presentation that is made: a sober design served by quality materials. Impeccable !! As for delivery: just as perfect. Bracelet leather as it appears in the photo that gives 4 or more laps depending on the wrist and the tense and that you can leave smaller if you cut it. It's cool, it's very cool. Product of good quality corresponding to my expectations and faithful to the photos of the site. The delivery time is respected, fortunately for the factor. Who was not flogged on the public square. The bracelet makes its high quality impression and has a nice brown color. The handling requires some practice but this is no longer an issue after some attempts. How they did, I do not know, but I received my order with postnords after only 2 days. That in itself should be enough to trigger a medal, but overall, the entire customer experience is just a tooth better than anywhere else, so I'll definitely be back here! Super service and selection at a bunch of happy tosses. The bracelet looked exactly like the picture, very nice and looked like a smack! To snap it was a bit tough but it went. Super pleased! Nice, stable, fits on every arm! A good, durable bracelet, was a gift, was great. Thanks to the brass clasp, you can customize it. A little oil or cream on it, it will be wonderfully supple. Very good that you can adjust the size just as you like it, it's hard to find bracelets or my narrow wrists. Was actually exactly what I expected. Nice quality bracelet and nice to wear. Am very satisfied with the delivered product. Everything ran smoothly and fast. It is much darker in nature than shown. Everything else fine. Fast delivery and a great product. And a good customer service. Satisfied with the product! Good description and photos so no surprises. Fits all sizes guy to man and a nice buckle. Simple bracelet, which is smart as it can be adjusted and cut to fit perfectly with one's wrist. Beautiful bracelet for good price. Tough leather bracelet for a nice price. Nice to wear loose but also in combination with other bracelets. The bracelet arrived in the shortest time and it was corresponding to the description. The fact that it is adjustable is convenient for both small and large wrists. This product remains simple and elegant. Nice bracelet with a good length that lets you cut shorter if you want. Good experience. There was no payment order after the order. Mail sent and problem was solved. Fast delivery and good quality. A nice, rough bracelet with a simple but blood-effective buckle. Top! Easy to get rid of. Beautiful product for reasonable price. Great fun company! Communication style was and is really fun!